I’ve never watched a film which has made me not-want to be an Astronaut, until now. Even though, at times, reality and physics is stretched, I found this to be an engaging and exciting film to watch. Had I worn a heart rate monitor during the viewing, I’m sure the average would have been much higher than normal. At the heart of it, this is a very simple movie. There are some people in space, things go wrong, the people have to do exciting stuff in order to survive and make it home. This would fall into the category of lame-thriller (lame because it relies on borderline-unbelievable coincidences as well as loud noises, to advance the plot) if it weren’t se well-done. Sandra Bullock and George Clooney’s performances also cement the film’s watchability by inviting the audience to connect emotionally with them. Bullock’s character is a reluctant mission-specialist. She’s the everyman that the audience is supposed to relate to. She freaks out when things go wrong, and she panics when being in space gets scary, like we all supposedly would. George Clooney plays the part of the cool, calm veteran with hundreds of hours of spacewalking under his belt. Together, they have to figure out how to get themselves out of what seems at first to be a rather hopeless situation. I complained before about the storytelling of 12 Years a Slave being very linear. 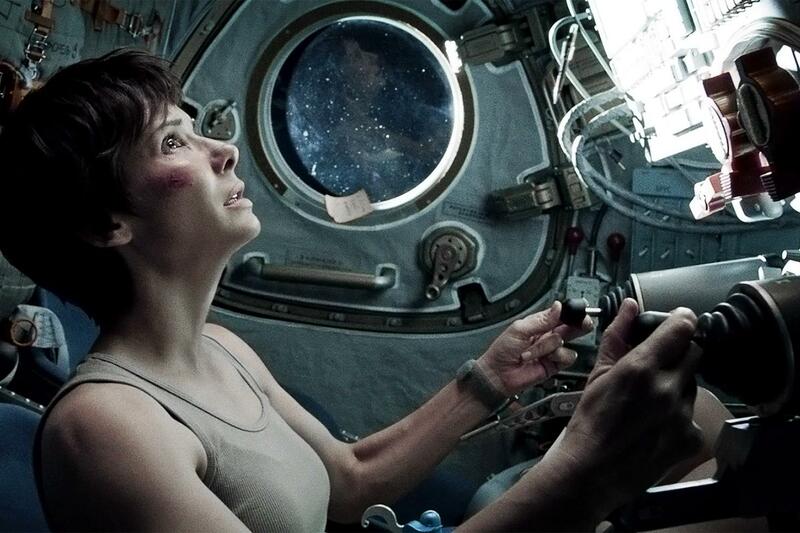 Well… Gravity’s storytelling is also… one-dimensional. However, the crucial difference here is that the pace is very different. It’s much faster, and necessarily so – first they’re about to run out of oxygen, then they’re about to run out of fuel, then the orbit is about to decay, etc. I would call those tidbits spoilers, except they’re extremely predictable and so common to ‘space’ movies as to be cliché. Importantly, this pacing means that there are no ‘dead spots’. Throughout the entire film, you’re basically waiting for that moment when you can breathe a sigh of relief, and it sometimes seems to come, but then doesn’t. That the makers of this film somehow manage to keep viewers on the edge of their seats for pretty much the entire film is quite an achievement. It’s only right at the end where you’re able to relax in your seat, and in that sense the film is paced in an unusual way. Usually, thrillers will have a build up, where all the parameters for the finale are established, then a slight pause where the hero has to collect themselves, and then the final act which builds up to the resolution, but not this one – there is basically one long, slow buildup all the way to the end. Out of all the nominees, I feel that this is the weakest one. It’s a bit too simple, and it’s really just a series of very well-executed cheap tricks. That doesn’t mean that it isn’t a good movie, it’s just not best picture material. It is certainly entertaining, and if you like thrillers, then you’ll like this. It may win the cinematography oscar, it may also win in the sound mixing and sound editing categories (although I personally think that the Hobbit has those sewn up).